TThe DELE exam (of Spanish language competency) is very different to the typical school or college foreign language exam. If you want to prepare correctly, then from the very start you need to be well informed about these differences – the unique goals of the DELE system, the assessment criteria that the examiners will use to score you, and the curriculum content. If you do not know and understand these key characteristics of the DELE – if you do not have a proper DELE exam preparation book explaining them – then you simply won’t be prepared to give the examiners what they are actually looking for. This applies as well to the DELE exam’s new online twin, the SIELE, which shares the goals, curriculum and assessment criteria of the DELE. Unfortunately, what little material exists about the DELE’s desired outcomes, assessment criteria and what the curriculum contains, is not easily accessible. The curriculum and assessment protocols are only available in high academic Spanish – policy documents written by academics for academics. Very few Spanish tutors know much about how the exam actually functions i.t.o. the assessment, as distinct from describing the simple format. This means that many candidates enter the exam poorly prepared, expecting something similar to school or college. More often than not, their preparation has consisted essentially of grammar revision – but grammar is just one of the nine chapters of the official DELE curriculum describing the prescribed exam content for the exam. Astute students, when they first encounter a DELE exam paper, immediately sense that this is a very different kind of challenge. Because the DELE tests what you can actually DO, in terms of really communicating in Spanish – it doesn’t set out to test merely what you KNOW. 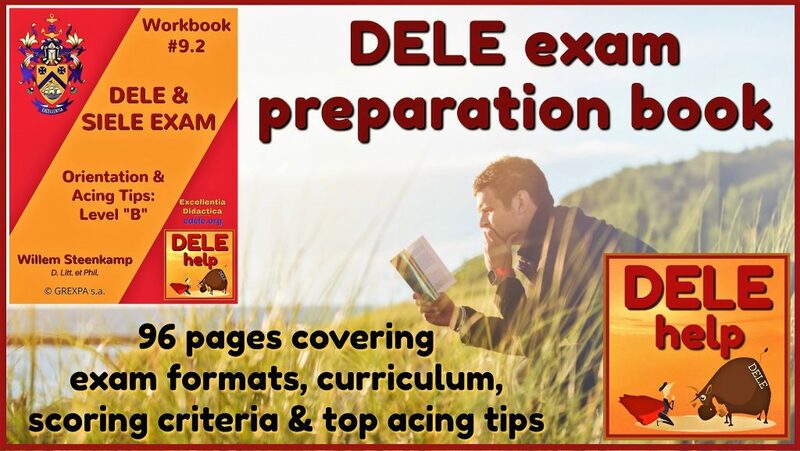 It is no surprise, therefore, that one of the highest-frequency search terms on the internet regarding the DELE exam, is “DELE exam preparation book”. Which hitherto has not existed, in English. Having myself prepared for (and passed) the DELE C2 exam, I have lived these frustrations. When I started preparing, I did so with a personal background that had made me aware of the importance of understanding assessment criteria. I had been sensitized to the science of didactics and assessment methodology during the time that I served as head of the South African diplomatic academy. This was during the transition to democracy in South Africa. I had to completely overhaul the training to make it suited to the needs of the New South Africa (after my stint at the academy, I had the great honour and privilege of representing i.a. President Nelson Mandela as ambassador). In preparing for my DELE C2, I therefore quite naturally wanted to know what the curriculum entails, and with what criteria the examiners will use to assess my efforts at speaking and writing Spanish. Nobody could really tell me, in any detail. Yes, I could get acquainted with the format, in the form of model exam books. But I could find no DELE exam preparation book that explains the assessment criteria, the actual deliverables or “outcomes” that the DELE system wants candidates to be able to produce, and which defines the content prescribed in the curriculum. Because of my experience heading the academy, I knew how vital understanding such “targeting” is, if one is to do well in any exam. I therefore set out digging and eventually got hold of the scoring matrixes, the instruction protocols for the examiners, and the massive, complex curriculum document. Taken together, what an eye-opener! I saw, for example, that three of the ten chapters of the curriculum dealt with history, geography, culture and tradition – to ensure a sufficient level of inter-cultural sensitivity that would, for example, enable one to correctly contextualize the meaning of many common Spanish expressions. I also saw that entire chapters are dedicated to identifying the “can do” statements or actual communicative tasks that candidates must be able to perform at each level, the “intercultural dexterities” that candidates must have developed, and the “genres of discourse and textual products” that the candidates must master – to name just some. Do you know the “can do” statements? DIn the curriculum omnibus, I was particularly struck by the chapter “functional language use” (what the Americans call the “can do” statements) which lists all the communicative tasks that you are expected to be able to perform at each level. This ranges from basics for beginners such as asking directions, to – at the higher levels – such sophisticated tasks as introducing a toast at a formal reception. These “can do” statements encapsulate the true scope of the prescribed curriculum for each level – but how many students know about this, and are ever prepared to be able to produce these essential deliverables? What I found even more important than the curriculum as such, was the policy material explaining the goals of the Common European Framework of Reference for Language (of which the DELE / SIELE is the Spanish iteration) and the four assessment criteria that examiners use to score your efforts. The CEFRL came about because of the abolition of the internal borders in the European Union. This allowed EU citizens to live, work or study in any country of their choosing. This borderless new union made it essential for the likes of employers and post-grad schools at universities, to have access to reliable certification of the actual ability of an applicant to truly understand the new target language and to make him/herself understood in it. And it was apparent that school and college certification simply didn’t reflect a candidate’s actual communicative ability. For example, the American Council on the Teaching of Foreign Languages recently found, in a survey, that only 0.5% of students at high school and college who majored in a foreign language, could actually maintain a conversation in that language. The authors of the CEFRL set out to try and correct this with their new policy, and the first thing they did was to change completely the focal point and goals of language tuition. No longer would the language as such be the focal point, as it is in the academic study of Spanish in high school or college. In academic study of Spanish, the language is dissected and analysed, as one would dissect frogs in Biology – without yourself becoming a frog. The CEFRL threw this approach overboard. Instead, it takes the student as focal point: the student as “social agent” who must be able to perform real-world communicative tasks in a foreign-language environment. The objective is thus not to fill the student’s head with abstract academic knowledge about the language as subject matter, but to equip the student to be able to DO – to actually use the language in real-world communication. To understand what you read or hear, and make yourself understood when you speak or write. This means, to master the four communicative competencies of listening and reading comprehension plus written and oral expression (which form the four units that the DELE exam consists of). So, if the examiners aren’t primarily intent on checking eagle-eyed what you know about conjugating Spanish verbs, but are assessing whether you are actually communicating effectively when you speak or write: what criteria do they use to score your effort? This, clearly, you simply HAVE TO KNOW if you are going to be able to give them what they are looking for. There are four assessment criteria, which at first glance seem very generic and woolly, if you don’t have a proper DELE exam preparation book that can clarify what is meant with each. Most students are quite surprised when they first learn that, for the oral expression for example, these four equally weighted assessment criteria are: coherence, fluency, sufficiency of linguistic scope, and correctness. In other words, 50% of your score will be assessed on coherence and fluency – but what does that actually mean, in terms of what is expected of you? What is understood under each of these criteria, and how are they applied to assess an individual’s performance, so as to arrive at a final score of pass or fail? Because being totally familiar with each of these assessment criteria is so very evidently of utmost importance to students who want to prepare correctly for the DELE, I felt that this was a gap that simply had to be filled. Therefore, I wrote a succinct, practical DELE exam preparation book for English-speaking students. This is truly the product of having “been there, done it”. Our in-house DELEhelp Workbook #9 of 96 pages is written from the student perspective. Its aim is to help you understand the goals, format, assessment criteria and prescribed curriculum content for the DELE, and also to share with you, practical tips for acing the exam – both in terms of how to prepare, and what to do on exam day. The best news is: DELEhelp’s DELE exam preparation book is available to you, entirely free and with absolutely no obligation to sign up with us for classes. Of course, we hope that it will help convince you of our ability to add value to your DELE exam preparation. But the decision whether you want to use our expert 1-on-1 tuition via Skype at only US$12 per hour, is yours and yours alone. 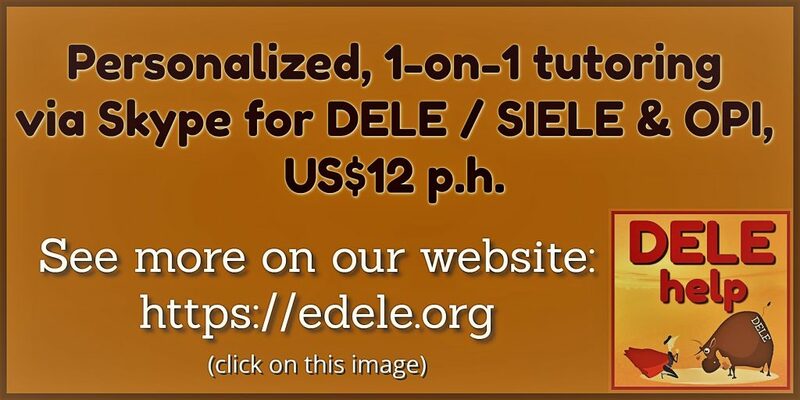 If you are preparing to do the new online twin of the DELE exam, called the SIELE, you should also use this same DELE / SIELE exam preparation book, since the goals, criteria and curriculum are shared (it is the same official who signs both the DELE and the SIELE certification, namely the Director of Studies of the Instituto Cervantes). As you can imagine, we have also developed an additional workbook about acing the equivalent American OPI test (the Oral Proficiency Interview). You can ask for this as well, if you are preparing for the OPIc. Since you are currently reading this blog post, you may already be aware of the many valuable articles guiding SIELE and DELE exam preparation that are available free in our DELEhelp blog. If, however, this is your first “landing” on our blog, check out the content list – you will see the dozens of posts with useful tips about how to ace the oral and the written expression tests, how to plan and what to focus on in your DELE exam preparation, how the DELE exam final score is calculated, and many more topics. 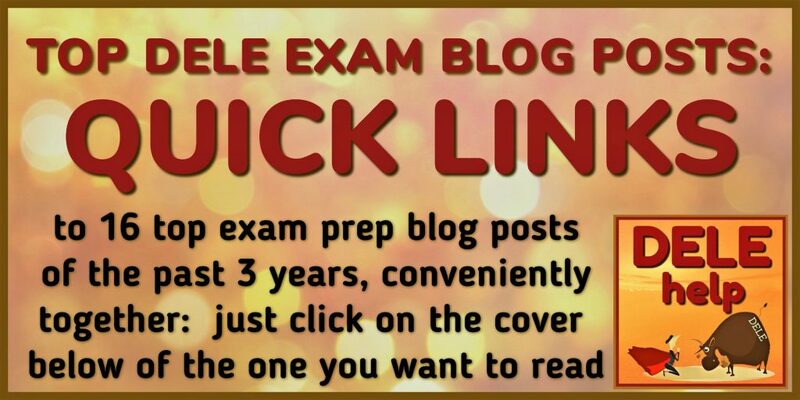 We are pleased to offer you all this material free in our blog, in the hope that it, too, will show you what our expertise can mean to you, for improving your chances of doing well in the exam. Of course, once you do sign up with us (if that is your choice) then you will receive the rest of our series of one-of-a-kind in-house DELE exam preparation books, again entirely for free, as part of the resources that we provide to every one of our students. 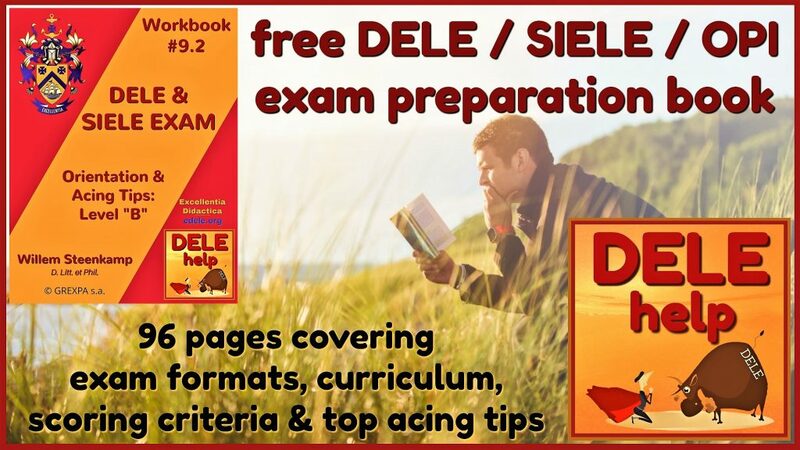 At a minimum, though, we hope that by reading this free sample DELE exam preparation book (number 9.2: DELE / SIELE Exam Orientation and Acing Tips), you will understand how different the DELE is. We hope that you will start to sense that extra confidence that comes from knowing precisely what you are up against. Also, that you will understand how you should best prepare yourself to meet the unique challenges presented by the DELE / SIELE exam, or the OPI. Properly planned and personalised preparation firstly requires such understanding as foundation, but also needs a proper initial diagnostic of your strengths and weaknesses as basis. Plus expert, experienced guidance that will provide you with feed-back and correction when you invest your time and mental energy in the essential practice, practice, practice required to become fluent, coherent and correct in your oral and written expression. Such expert guidance is best provided one-on-one, not in group classes dominated by the lowest common denominator. And why not use modern online tech to have expert tuition in the comfort of your own home, with flexible scheduling, and at low-low rates that reflect Central American overhead costs, not those of North America or Europe…? To ask for your free copy of our DELE exam preparation book, simply click on the image below and send us the completed contact information form so we can e-mail you the download link (it is available as a .pdf e-book). Buena suerte with your Spanish exam preparation!